Indiana gun crimes and weapons offenses are found in Indiana Code 35-47. 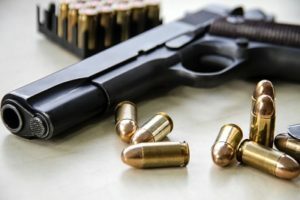 This section lays out the laws for who may possess a firearm, the laws and regulations concerning the sale and transfer firearms, regulations for serious violent felons and laws regarding when and where an individual may carry a firearm. Being charged with a gun crime or other weapons charge is very serious and can lead to harsh punishments if convicted. It is important to have a lawyer on your side that understands the criminal statutes and search and seizure law, as well as the possible consequences, so they are able to aggressively defend your rights and freedom. Chambers Law Office is here to help. Julie Chambers is a former Marion County Deputy Prosecutor and now focuses her criminal defense practice on misdemeanor and felony crimes. She represents clients in a variety of criminal cases, including gun crimes such as carrying a handgun with a license, unlawful sale or transfer charges, possession of a firearm by a serious violent felony, and pointing a firearm. If you or a loved one has been accused of a gun crime, contact Chambers Law Office today to speak with an attorney. Call 317-450-2971.